The Iraqi town of Halabja is dominated by Kurds, the group that has been fighting the Islamic State in northern Iraq. However, some Kurdish residents have been slipping away to join the Islamic State. Iraqi Kurdish Peshmerga fighters take up positions in September around Gwer, in northern Iraq, as part of their fight against the Islamic State. Kurdish forces are now trying to prevent young Kurdish men from cities like Halabja from joining the Islamic State. His sister doesn't want her name, her brother's name or her mother's name publicized. She's afraid that the Asayish, the Kurdish security services, could arrest or harass them for speaking about it. She's not sure why her brother went. They lost contact 15 days ago, and she has no idea if he's fighting in Syria, or inside Iraq. "My mother wants to go get him," the woman says, "but the Asayish won't let her." On her street alone, eight boys have joined ISIS. Two were killed this week. "They are being brainwashed," she says, and the young boys pressure each other to go. 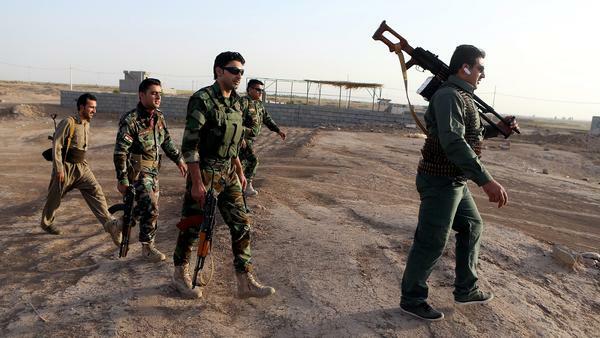 The Iraqi Kurds, with the help of the U.S., are waging war against ISIS. But the Kurds are also facing an internal threat to their largely autonomous and peaceful region in northern Iraq. Hundreds of young Kurdish men have joined ISIS, according to the Kurdish security forces and other officials. Mostly they're young men influenced by online propaganda or by local extremists. 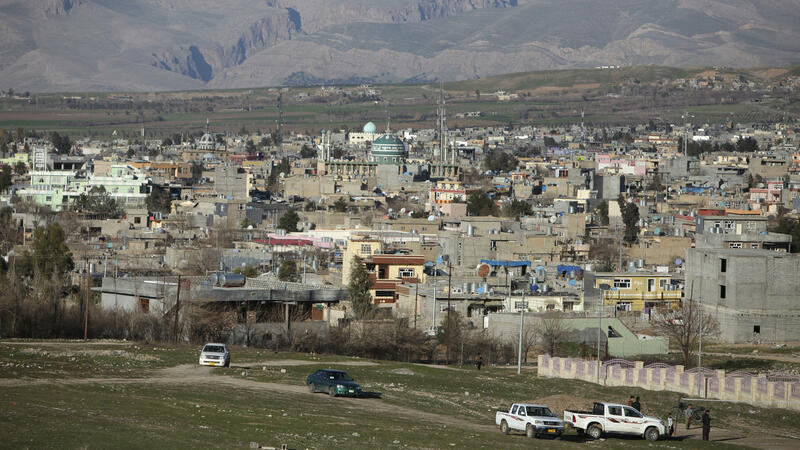 And in Halabja, residents say young men there are particularly susceptible because of the high unemployment rates and the lack of services provided by the Kurdish authorities.The area also has a history of militant Islam. Estimates vary on how many men have joined from Halabja and the surrounding areas. They range from 85 to 600. Shakas Sleik, 24, a university student in Irbil who is from Halabja, knows nine people who disappeared and went to fight with ISIS. Among them is his second cousin Shahed. Shahed's dad is a fighter with the Kurdish peshmerga forces who has been battling ISIS for months now. The family says Shahed disappeared in the summer and was killed last month in a U.S. airstrike in Beiji, north of Baghdad. Sleik says learning of his death was devastating for Shahed's parents and for himself. They were all grieving and shocked that he was fighting inside Iraq, maybe even fighting against Kurds or his own father. Sleik says that perhaps his cousin would be alive if Kurdish authorities had provided an alternative for young people in Halabja, a city that has seen its share of tragedy. Some 5,000 Kurds in the city were killed in 1988 when Iraqi dictator Saddam Hussein used chemical weapons on the population. Many residents say the Kurdish authorities never helped the city recover. Today, the response to the disappearing young men has been intensified security. On the main drag of downtown Halabja, where people drink sweet tea from street vendors, packs of Kurdish security forces are on every corner. There's a midnight curfew to keep young men inside. And with a few exceptions, anyone who dies fighting with ISIS cannot be mourned. Funerals for those killed are banned, and no one calls them martyrs, at least not publicly. Iraq's city of Halabja became known to the world when thousands died after Saddam Hussein launched a chemical attack on the Kurds there. For years, Iraq's Kurds have been allies of the U.S., most recently in the fight against ISIS. Yet in this largely Kurdish city, there are young men who are being drawn to ISIS. NPR's Leila Fadel brings us this report from Halabja. LEILA FADEL, BYLINE: We knock on the door of the family home of a 16-year-old boy who disappeared. His family says he lied to them. He said he was going on a picnic with a teenage friend, but they never came home. FADEL: His older sister answers the door. FADEL: He disappeared in May, she says. A few days later, a letter arrived in his handwriting. It said, I'm in Syria. Don't look for me. He had joined ISIS. She doesn't want her name, her brother's name or her mother's name publicized. She's afraid that the Asayish, the Kurdish security services, could arrest or harass them for speaking about it. FADEL: She's not sure why her brother went. They lost contact 15 days ago, and she has no idea if he's fighting in Syria or inside Iraq. FADEL: My mother wants to go get him, the woman says. But the Asayish won't let her. Do you think a lot of young men are going? FADEL: Yes, she says, and begins to count. There are four on this side of the street, two across the way and two up the road. They're being brainwashed. And they're feeling pressure from their friends to join. On this street, two of those teenagers have been killed. And the rest? Well, no one knows. The Kurds in Iraq who are waging war against ISIS with the help of their U.S. ally are also facing an internal threat to their largely autonomous and mostly peaceful region in northern Iraq. Hundreds of young Kurdish men have joined ISIS. Mostly they're young men influenced by online propaganda or by local extremists. And in Halabja, residents say young men there are particularly susceptible because of the high unemployment rates and the lack of services provided by the Kurdish authorities. Estimates vary on how many men have joined from Halabja and the surrounding areas - anywhere from 85 to as many as 600. SHAKAS SLEIK: (Foreign language spoken). FADEL: Shakas Sleik is a 24-year-old university student in Irbil. He's from Halabja, and he knows nine people personally who disappeared and went to fight with ISIS. Among them is his second cousin, Shahed. Shahed's dad is a fighter with the Kurdish Peshmerga forces. He's been battling ISIS for months now. The family says Shahed disappeared in the summer and was killed last month in a U.S. airstrike in Baji, north of Baghdad. FADEL: Shahed's cousin, Shakas Sleik, says learning of his death was devastating for Shahed's parents and for himself. We are all grieving and shocked, he says, that he was fighting inside Iraq, maybe even fighting against Kurds or his own father. FADEL: Sleik says perhaps his cousin would be alive if Kurdish authorities had provided an alternative for young people in Halabja. It's a city that suffered through a massacre in 1988 when Saddam Hussein used chemical weapons on the population. And many residents say that the Kurdish authorities never helped the city recover. But so far, the response to the disappearances has been intensified security. On the main drag of downtown Halabja where people drink sweet tea from street vendors, packs of Kurdish security forces are on every corner. There's a midnight curfew to keep young men inside. And with a few exceptions, anyone who dies fighting with ISIS cannot be mourned. Funerals are banned for those killed. And no one calls them martyrs, at least not publicly. Leila Fadel, NPR News. Transcript provided by NPR, Copyright NPR.